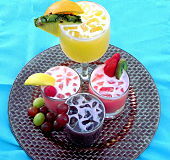 Want a variety of fruit juices to tickle your fancy? Here you go..all made with gelatin protein which like collagen is great for your skin! Flavors include: Cran-Grape, Wild Berry, Grapefruit, Lemon Razzy, Pineapple Orange and Strawberry Kiwi!